The date has arrived!!!! 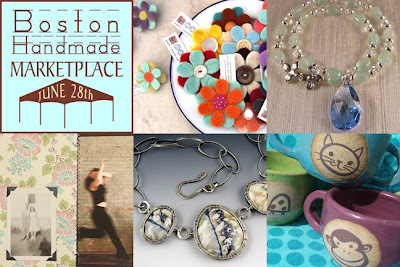 After only a few months of planning and preparations we are ready to gather together for our largest handmade show ever as part of the Somerville Arts Council ArtsUnion series! Come out to support handmade and check out work by more than 25 exhibitors showing one-of-a-kind and limited edition art, clothing, jewelry, housewares, toys, paper goods, and more, all made by hand in small studio environments from all over New England. Also on tap during the show is live music by local bands The Grownup Noise and James Christensen. Purchasing work made by local artists, artisans, and craftspeople minimizes your carbon footprint and supports small business owners working to make their way in our world of factory goods. Shop local, buy handmade, and support your neighborhood economy! My name is Kathy, and I'm Nancy MacCallum's (Nancy Rosetta) sister. I helped her today a tthe show. I had a really fun time today, met sme really nice folks and picked up some wonderful items from some of you. Thanks for all of your great creative work. I am enjoying all of my new toys! !